My idea of heaven: a wine bar with over 60 kinds of wine and flights ($15) to try them. A friend and I stopped in Vintage Wine Bar & Bistro after work on a cold, cold Thursday evening and found it to be surprisingly uncrowded. That's not to say it was empty. It was definitely not that. But we were expecting standing room only. There were several open tables and we were happy to occupy one of them. The bitter cold could have kept people away. I checked the online wine menu and it's not up to date with what we had in the restaurant, but it gives you a good idea of the variety. It's a narrow space with a few tables up front (ideal in the warmer weather when they open the tall windows), a long bar and high tables along the wall. Comfy, casual and candles on the tables. A chandelier made out of empty wine bottles is definitely an eye-catcher. Lots of ambiance and lively characters here. We started with the Brie en Croûte ($12), Baked French Brie wrapped in puff pastry served with caramelized pear and finished with a gastrique sauce. The brie could have been melted a bit more, but the sweetness was a nice counter to the cheese. Very yummy if you like sweet. Keeping it light and healthy since we're still recovering from holiday gorge, we both had salads with grilled chicken (add $4). She had the Caesar ($7.5), nicely topped with fresh shaved parmesan, and I had the Vintage House Salad ($7), mixed greens, haricots verts, shallot, pine nuts and cherry tomato served with a honey truffle dressing. Not overpowering with flavor, but light. Left me plenty of room to enjoy my malbec. Great place to try new wines. There are a number of restaurants near Ardmore that we keep putting on the backburner. We'd much rather head out in the city. But, it's a new year, so we thought we'd start crossing them off the To Do list. 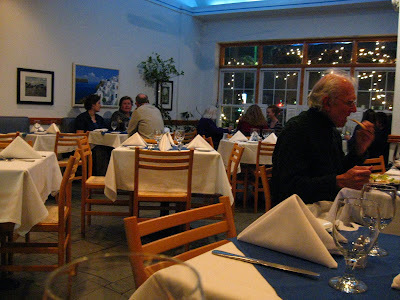 Thankfully, I did not see the Lourdas Greek Taverna website beforehand because I would have crossed it off the list permanently. At the front door, we hesitated, noticing the brightness, lack of candles on the tables, age of diners - all my usual check points for good ambience were missing. But a friend recommended it and we were already there, so we pushed forth. 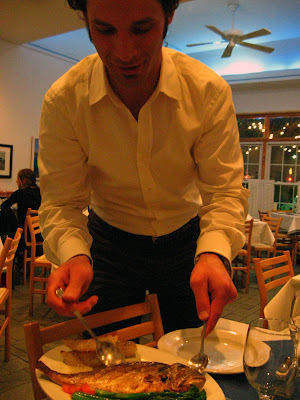 Aside from the waiter who was nearly void of personality and humor, and of course, the lack of ambience, the food was fresh and good tasting with the standard greek ingredients (olive oil, garlic, olives, feta). 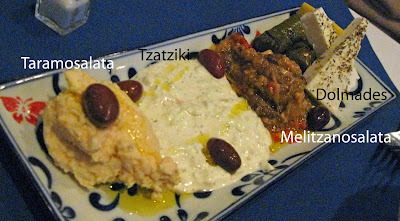 We started with the Pikilia: dolmades, tzatziki, melitzanosalata, taramosalata, Feta cheese and Kalamata olives (12.95) and served with warm pita wedges. For two people, this was a lot of food. And if you're not up on your Greek, dolmades are delicate parcels made from grape leaves (also known as vine leaves) stuffed with long-grain rice, fresh herbs and seasonings. Tzatziki is a yogurt, cucumber and garlic dip. Although ours was more like a sauce--way too yogurty. Melitzanosalata is an eggplant dip (and I only know this because I looked up the word). If that's what we ate, it was sweet and our least favorite of the four. Taramosalata is a caviar spread. We enjoyed this one the most. 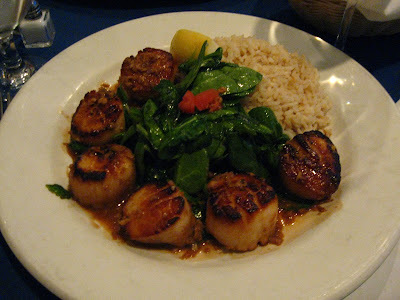 I opted for the pan-seared scallop special which came with wilted spinach and rice. Six huge scallops arrived nicely seared. Tasty, but again, too much food. The whole fish special was a light fish similar to sea bass and seabream, forget the name, sorry. It was cooked perfectly, filleted tableside and included broccolini and roasted potatoes. Everything was very good and with great sized portions for a very affordable price. In these economic times, in the burbs, this is a great option. What others say: here; here; and here.